A friend recently advised me to start using blush! I could not believe it - my cheeks were always so red that using blush was only an option AFTER using a concealer of some kind. With my sensitive skin that was never very appealing. But should I really start using blush? It's the result of using Eucerin Redness Relief to good effect for almost a year now. That friend saw me with the day foundation on, which is green, so it conceals the redness partially. Since then I've started using the foundation (they call it a daily perfection lotion) more specifically: covering up the places where I want to be less red, and leaving part of my cheeks untreated. That way the natural redness is seen only where I would have put blush. Now I have to get used to having a face that is clear enough to start thinking about mascara and eye shadow. Used to be that the most important thing I thought about doing (never did - because I have sensitive skin) was covering up that redness. But recently I went to a wedding with eye shadow and mascara on - it felt great! I've not followed up yet on that friend's suggestion to start using blush, but maybe in future I will... on special occasions perhaps. Any change in how we look has a psychological impact. Whether it's losing weight, getting rid of pimples or like me: getting rid of red cheeks. Me now - redness under control! Most people who have rosacea, like me, also have sensitive skin. 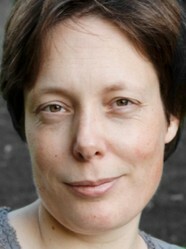 As I said: this has prevented me from using makeup for most of my life. 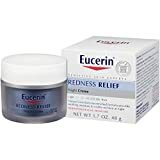 One of the reasons I am recommending the Eucerin line here is because my skin didn't respond to it at all - in fact it got better from me using it. Just use this like any other foundation: put it on, wash it off when you put something else on. The night creme I simply put on at night. It gets washed off in the morning. The day stuff is more a foundation: just put it on & wash off when going to bed, like any other foundation. A light night cream that doesn't just treat my skin for Rosacea, it also makes it soft and more even. I haven't had pimples at all since I've used this. It can also be used during the day, except it doesn't conceal the redness at all. The day cream I use. I use it especially on sunny days, because sunlight increases the redness on my skin. In winter I usually just settle for the night cream. What else can you do to reduce redness in the face? You can do a lot actually. Most of these are what not to do. In taking care of yourself, your skin can get better too. Avoid the sun or use heavy factor sunscreen. It isn't a good idea to avoid the sun totally. We all need vitamin D. Just don't sunbath for a long time and when you are out in the sun long, use a hat or something to protect the face. Minimize caffeine intake (coffee, tea, some sodas: most herbal teas are alright). Use products that work for your skin. We are all different. There is no day creme, because, just as you say, it makes more sense to use the redness relief foundation that also has SPF 15 included. Nope, they're both by Eucerin and they're both part of their redness relief line. The redness relief line consists of the night creme and the day foundation. The latter has SPF 15. I mean, I see the night creme, and I'm assuming there's one for the day as well, but why would you use the latter as a foundation is the SPF 15 lotion works the same way (to give redness relief)? So the Eucerin redness relief and the one with SPF 15 are two separate lotions?